How can you benefit from using Zapier? Here is a brief explanation of what Zapier is directly from the source itself. Zapier is a web automation platform that allows you to connect hundreds of web applications and services to each other. With Zapier you can create, as they call it, “Zaps” that pair a trigger to one or multiple actions. 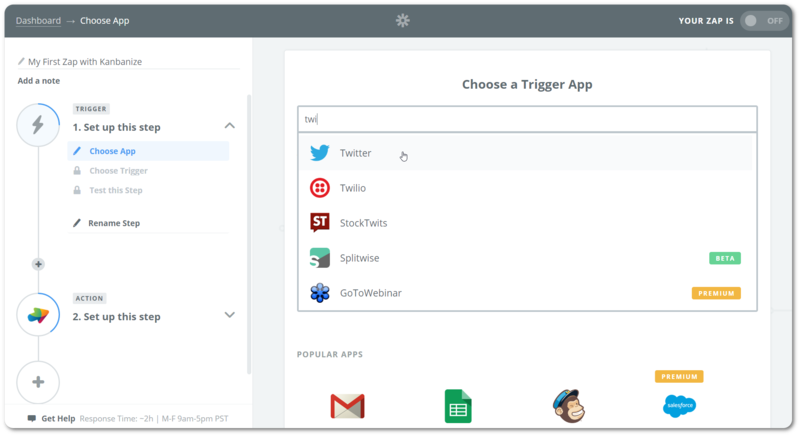 Whenever the trigger event occurs, Zapier automatically completes the actions for you. What makes using Zapier even more awesome is that you don’t need to be a developer to make a Zap, anyone can do it! Check out the opportunities in the app directory. How can I set up a zap between Kanbanize and another service, using Zapier? 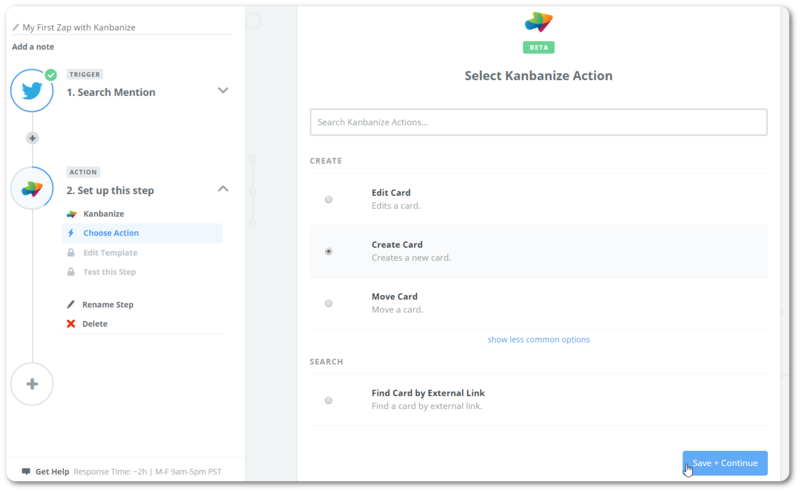 To begin with the integration a user has to make a "Zap" with Kanbanize. You can create a "Zap" via the predefined templates or custom a new one that matches your scenario. You need to choose an app that will serve as a trigger. This choice can be made from the menu on the left side of the Zapier interface. Select to “Set up this step” and a drop-down menu will appear. First, you need to find the app that you wish to connect with Kanbanize. Depending on the one you select, there is a different number of triggers that can be applied. 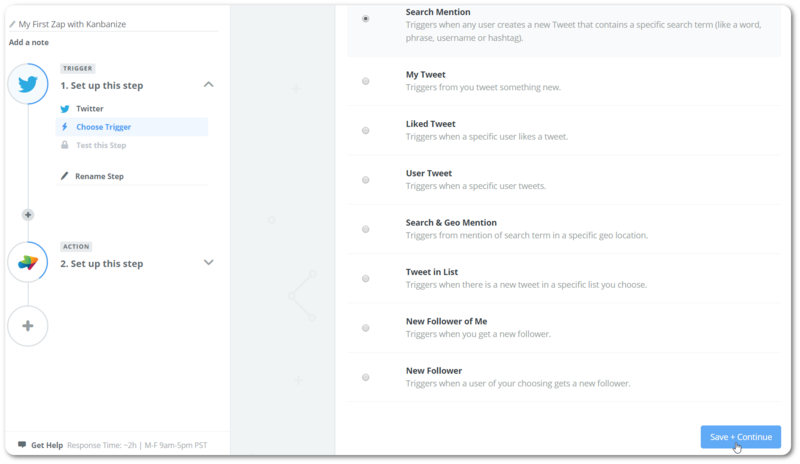 For example, if you choose Twitter, there are eight set-offs available, Google Sheets has four, Wufoo – five triggers, and so on. Let’s create a zap between Twitter and Kanbanize as a basic example of the process. Choose a trigger action. Let’s select “Search Mention”. 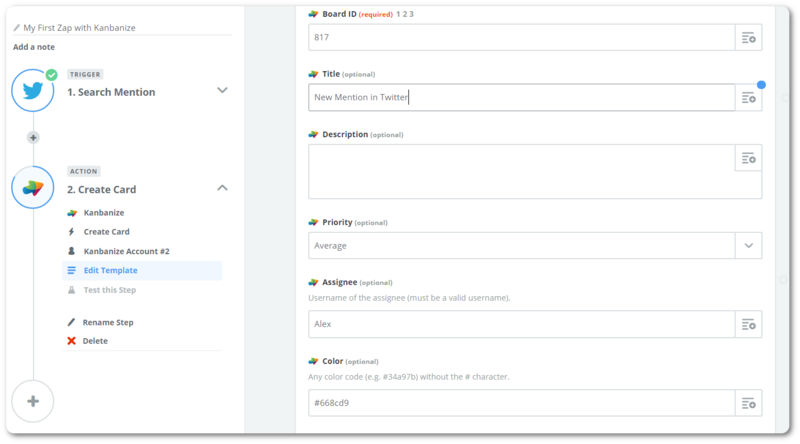 It will trigger an action in Kanbanize when any user creates a new Tweet that contains a specific search term (like a word, phrase, username or hashtag). 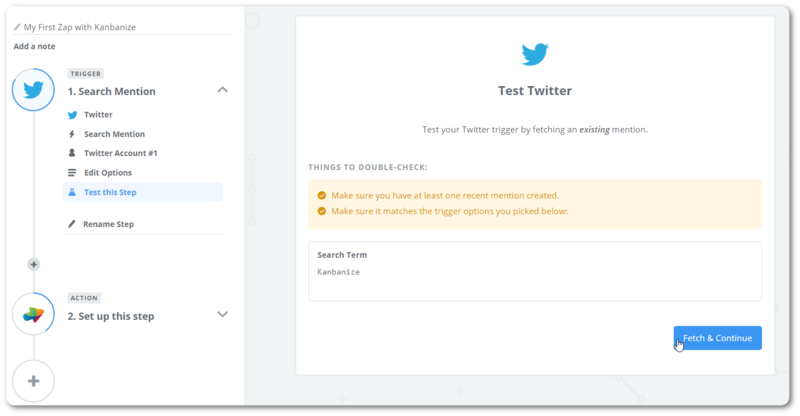 Upon selecting the trigger, you need to connect a Twitter account (or multiple ones) and proceed to the next step in which you can specify the term that you wish to be notified about. Test the step and proceed forward. Further, you need to define what you wish to happen in Kanbanize when the trigger is activated. A typical scenario would be to create a new card in a swimlane dedicated to social media monitoring. 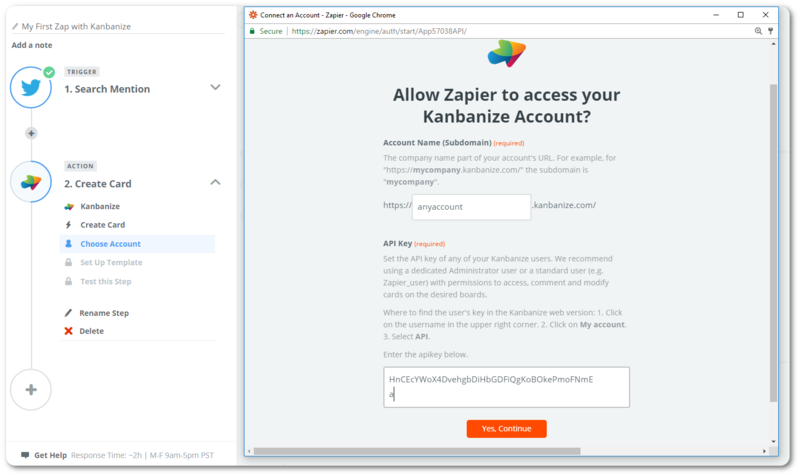 To confirm your subscription in Kanbanize, you’ll be asked to enter a Kanbanize account and validate it with an API key. To generate an API key, go to your account, click on the user dropdown menu at the top right corner and select API. Copy the key that appears there and place it in the dedicated field in Zapier. Then you can continue to the next step of the process. Set up the criteria of the card that will be created every time the trigger activates. This step is very customizable. The only mandatory field will require you to fill in the ID of the board that you wish to integrate in order to define the location of the new card. Everything else is up to your preferences and needs. After you are done, proceed to finish the integration. Before you get back to work, don’t forget to turn on the zap.